Brian Howell, the man behind The Bee Man, was just a kid when he started making candles. He’s been honing his craft since age 12, and more than 20 years later, his experience shows in every one of his exquisite, hand-poured candles. Brian uses intricate molds to cast his sculptural candles, which include Peter Rabbit, egg and baby chick candles. 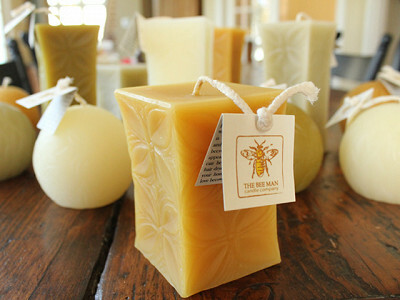 They’re all made from 100% pure beeswax, which is known for its clean-burning, smokeless, and dripless qualities. Brian insists on using cosmetic-grade beeswax, which he sources from rural beekeepers in four countries, and he has developed a technique for pouring the wax so that less air gets into the molds, producing unusually dense, longer-burning beeswax candles. For a gift or for your own home, The Bee Man’s candles are worth buzzing about. 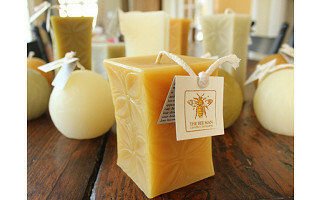 I am so excited to share our passion for bees and beeswax candles with you today. Our candle collection is simple-- colors and styles inspired by nature and designed by our artists. I have been keeping bees and making beeswax candles for over 20 years. I have seen and experienced the changes and pressures on beekeepers over these years. Increased pesticide use, decreased farm land for bee foraging, new diseases popping up left and right and a change from small scale beekeeping to massive operations for pollination are changes we watch. Our focus has remained the same however…constant research to bring you the purest and most beautiful functional candles available. I hope that you enjoy the experience of burning our candles as much as we enjoy making them for you! I look forward to answering your questions and hearing your feedback. I love the pillar candles-- I bought one a couple of years ago with a matching stand from Roseberry-Winn pottery in Tiverton, RI. It is their design. @Carey: Thanks for sharing! I have submitted this to our Discovery team and maybe we'll be able to feature more of their creations in the future. Their designs are just gorgeous with Brian's candles. @Katherine Klinger: Thanks! I pinned it to the "Grommets I want to see" board too!! Thank you so much for your compliments! I love The Roseberry-Winn Collection. They truly are amazing designers and the candle concept was very exciting for us! Each one is truly unique and hand finished to give a look that compliments Bruce's artistry. When lit, I feel these candles bring the design alive. Thanks again for your comments and @Carey...so glad that you loved them the first time you bought them! The Bee Man Candle Company name is synonymous with impeccable quality and attention. When you buy from Brian Howell, you aren't just buying another run-of-the-mill candle. You are buying the passionate care of someone who values the bee from field to hive and to your home. Brian made the candles for my wedding several years ago and they were a unique and memorable touch to the event. If you want the best beeswax candles money can buy, click "Buy Now." I met Brian many years ago as a young teen, when his family went to the same church as my family. Brian and my sons Mark and Ryan became great friends, and Brian has always been like one of my sons. I have loved watching Brian grow professionally and personally in the last 20 years. His love of science, and his experience as a bee keeper, I believe, has been instrumental in the way he produces a superior product. His heart goes into every candle he pours. Brian puts 100% of himself into his product. It's his passion, and it shows. I still have a candle he gave me almost 10 years ago when we were in college, and I can only bring myself to dust it rather than burn it. Your candles look wonderful, Brian. Would love to see some with a bee design on them! I was pleasantly surprised to see where you are located. I lived there for a few years, and in many of the other towns around that area. I was actually born in Syracuse and grew up in Cazenovia. Nice to meet you! Brian Howell, the man behind The Bee Man, was just a kid when he started making candles. He’s been honing his craft since age 12, and more than 20 years later, his experience shows in every one of his exquisite, hand-poured candles. Brian uses intricate molds to cast his sculptural candles, which include Peter Rabbit, egg and baby chick candles. They’re all made from 100% pure beeswax, which is known for its clean-burning, smokeless, and dripless qualities. Brian insists on using cosmetic-grade beeswax, which he sources from rural beekeepers in four countries, and he has developed a technique for pouring the wax so that less air gets into the molds, producing unusually dense, longer-burning beeswax candles.